Alfred John Gundry was born in April 1882 at Bradpole, near Bridport, Dorset, and baptised at Bradpole on 7 May 1882. He was the son of agricultural labourer Frederick Gundry (b 1853) and his wife Mary Hannah (b 1857). By the time of the 1901 census Frederick and Mary had moved their family to Bradford Abbas, just south of Yeovil. Living with them were their eight children; Annie born 1881, Alfred born 1882, Joseph born 1886, John born 1890, Walter born 1894, George born 1896, Bessie born 1899 and Henry born 1900. The family had clearly moved around since their children had been born at five different locations. In this census Alfred listed his occupation as a labourer on a farm. The family soon moved to Preston Plucknett, Yeovil, and for five years Alfred worked at Chaplin & Co in Yeovil but by the time of the 1911 census he was working as a railway shunter at the GWR goods station at Hendford. In the census Frederick listed his occupation as a shepherd while three of his sons, Joseph, John and Walter were all employed as farm labourers and George was employed as a house-boy at the Bell Inn. When war broke out Alfred left his job in the Hendford goods yard and enlisted in 1st Battalion, Somerset Light Infantry as Private Alfred Gundry (Service No 15548). He was initially stationed at Plymouth for his basic training. At the outbreak of war in 1914 the 1st Battalion was with 11th Brigade, 4th Division. The Battalion landed at Le Havre, France with the British Expeditionary Force (BEF) on 22 August 1914 and remained on the Western Front with 4th Division, throughout the war, suffering 1,315 losses. Alfred joined his Battalion in France on 6 April 1915 at which time his unit was preparing for the Second Battle of Ypres. He was soon promoted to Lance Corporal, probably as much because of his age as well as his ability. The Regimental History of the Somerset Light Infantry takes up the story of the next few days "The 1st Somersets occupied and entrenched a line from Chappel in Fortuin to Hill 37.... Having reached their allotted positions the Battalion set to work to dig in as effectively as possible in the short time before dawn of the 26th broke, for with the coming of daylight it was certain they would be exposed to a merciless shelling. But as there was a scarcity of entrenching tools, and no Brigade tools were available, the 1st Somersets were only partly entrenched when morning arrived, and what trenches there were, were shallow and afforded little protection unless the troops laid down flat. Dawn broke at about 3:30am and it was not long before the Somerset men and other battalions of the 11th Brigade were spotted by the enemy. Immediately the whole Brigade line was plastered with shell, which continued falling heavily throughout the day. One battery absolutely enfiladed C Company's trench. The Germans kept the supporting trenches under a rain of shrapnel, so that the supports did not dare show their heads above the parapet, and searched the high ground behind with high explosives to stop movements of reserves. All day long nothing could be done but like close and make the best of a desperate situation.... The Somersets had, however, suffered about 40 casualties during the day." This included Lance Corporal Alfred Gundry who had only been in the front line for three weeks. He was aged 33. On 14 May 1915 the Western Gazette reported "Mr and Mrs F Gundry, of this parish (Preston Plucknett), have been officially informed, that their second son, Lance Cpl Alfred Gundry, has been killed in action. The deceased soldier, who was 33 years of age, enlisted in the 3rd (sic) Somerset LI on the outbreak of hostilities and was stationed at Plymouth for training. He crossed to France on six April, but his services in the trenches was short, as he was killed on the 26th of the same month. Lance Cpl Gundry was in the employee of Messrs Chaplin & Co at Yeovil for five years, after which he was employed as a shunter at the GWR Goods Station at Hendford for a similar period, and which position he left to join the army. Mr and Mrs Gundry have three other sons serving their country. Joseph is with the Dorset Yeomanry on foreign service; water is stationed in the Eastern Counties with the West Somerset Yeomanry; and John recently sailed for France with the Somerset LI. They are the four brothers of Miss J Gundry, at the Half Moon Hotel, Sherborne." 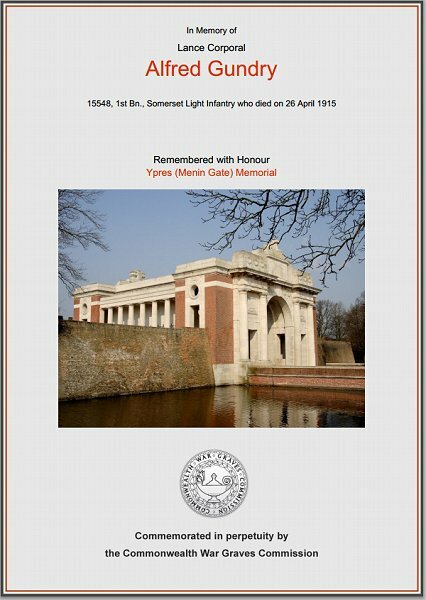 Alfred Gundry is commemorated on Panel 21, Ypres (Menin Gate) Memorial, West-Vlaanderen, Belgium, and his name is inscribed on the Preston Plucknett War Memorial. The Commonwealth War Graves Commission certificate in memory of Alfred Gundry.